This is just amazing, not only is it huge, the proportions are correct. It took someone a lot of time to map it out and even more to plant it. I don’t know who they are, but thank you for what you have done. With things which are currently going on in our country, it is great to see the American Spirit is still alive. 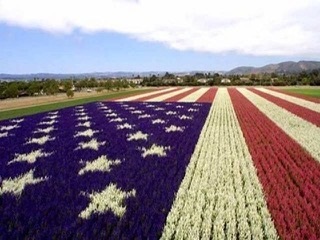 Between the fields where the flag is planted, there are 9+ miles of flower fields that go all the way to the ocean. The flowers are grown by seed companies. It’s a beautiful place, close to Vandenberg AFB. 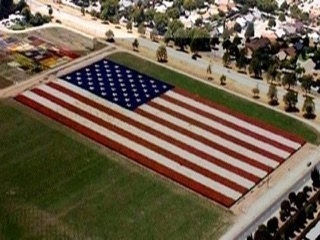 Check out the dimensions of the flag. The Floral Flag is 740 feet long and 390 feet wide and maintains the proper Flag dimensions, as described in Executive Order #10834.